Interview with EDG coach Aaron: We did not handle the details well This article is translated from [??????&???LOL??????] (Original Source) http://wangyou.pcgames.com.cn/434/4349222.html Original Title in Chinese: EDG??????????????? Original Title in Chinese: EDG???????????????? Today we had the chance to interview EDG coach’s Aaron. He said that the team deliberately saved their strength in the Group Stages and is ready to begin their end-of-tournament preparations.
? 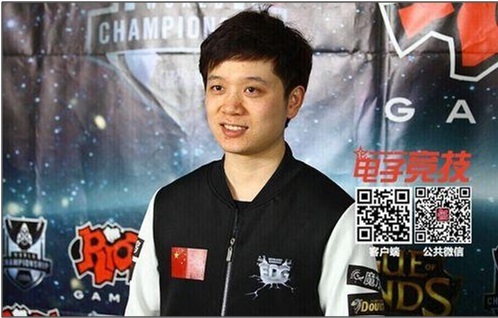 ?Q: EDG has a good seed in the Ro8 and is likely to meet Royal Club. They have said that they are more willing to face EDG because they are more familiar with you guys. What does EDG think about this and do you have any special strategic arrangements? ?Aaron: No matter what team we meet we will do our best to win. However, II personally feel that the team might perform better in a Chinese regional battle.
? ?Q: U has said that Chinese and Korean teams are often similar in terms of skill at the laning phase but if you cannot handle some details then the Korean team can seize the moment. As a coach, what strategic and tactical arrangements do Chinese teams need to improve? ?Aaron: The gap between China and South Korea during the laning phase is not big but there are gaps in individual ability, which we still to improve on. Like U said, we need to pay more attention to the details, otherwise we will spend the whole game under a lot of pressure..
? ?Q: Do you think that the Chinese Battle Plans are too rigid or stubborn? For instance, do you think teams rely too much on mid lane initiators and Maokai picks top lane. Aaron: Instead of rigid, I would say that we are explicitly trying not to reveal our strategies. Samsung White is doing the same. By exploiting the other team’s weakness and banning their strong champions we can avoid showing too much of our plan.
? ?Q: Does that later at Worlds, Edward Gaming will show a special strategy? ?Aaron: It is not really a special strategy. However, we are playing a sequence of games so we cannot just use the same strategies all the time. We will definitely be prepared.
? ?Q: Can you give me a rundown for how each of the 5 team members performed? ?Aaron: If we can advance, then each player should have at least 60%. If we can not qualify, then we definitely have failed. For U, I can tell that he has used a lot of stamina too early. ClearLove is just right. Koro needs improvement. I expect our bot lane to restore their status as soon as possible.
? ?Q: Is NaMei recovered yet? ?Aaron: First, the Korean players are very confident. You can tell from the way they play. Second, they are guaranteed to advance, so they can play more relaxed. Third, it’s clear that they can be relaxed in this group. To be honest, they are clearly better than the other teams.
? ?Q: When you arrived in Taiwan, what teams have you scrimmaged against? Have you scrimmaged against Korean teams? Aaron: Yes we did! Recently we have scrimmaged with the corresponding group. However there is only one Korean team in our group so that is all we had. However, because of a network problem later on we had to cancel our scrimmages with the rest of the Korean teams.